Input text: a 1st factory is facing right. a 1st oil drilling rig is 50 feet behind the factory. the sun is brown. a 2nd large factory is 50 feet behind the 1st oil drilling rig. it is facing left. a 2nd oil drilling rig is 50 feet behind the 2nd factory. a 20 foot high tree is behind and to the left of the 1st factory. the ground is dirt. a 1.1 feet tall gold "TRUMP NATIONAL" is 0.1 feet right of and -19.1 feet to the front of the 1st factory. it is 2.9 feet above the ground. it faces right. a 1.3 feet tall gold "FOREST" is -2.6 feet above the "TRUMP NATIONAL". it faces right. the trump is behind and to the right of the 1st factory. 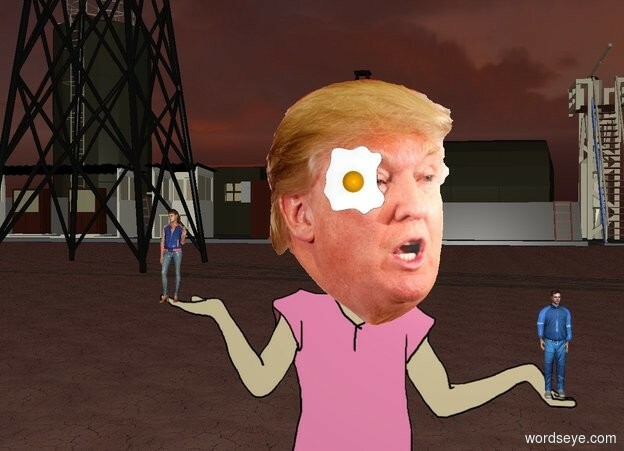 the egg is -12 inches above and in front of the trump.it is face down. A very tiny man is -3.4 inches to the right of the trump. he is 3.3 feet above the ground. A very tiny woman is -3 inches to the left of the trump. She is 3.9 feet above the ground. the large fox is 3 foot in front of the trump. it is facing back. Ah,the stress of winning something greater than a reality show position.......the only solution.... put people in positions that allow you to control the outcome by firing or manipulating their jobs. "Oh no I've said too much; I haven't said enough."